Treat Your Family To An Unforgettable Getaway This CNY! Chinese New Year is just around the corner and it’s going to be yet another long weekend (yay)! Instead of bonding over the dining table at home, why not do something special this year and take the entire family abroad for a quick getaway instead? Nothing binds a family together more than an unforgettable overseas holiday and the vivid memories of the trip to savour for years to come. Whether you’re looking to chill in an idyllic beach getaway, looking to immerse in the energy of a major metropolitan city, or looking to experience the wonders of an ancient culture, we’ve got some great recommendations for you. Don’t forget to get travel insurance coverage as part of your preparations so that your stress-free holiday remains stress-free. Hint: check out our “Thank Etiqa It’s Friday” page for travel insurance promotions. We Love the Sun, the Sand and the Sea! If it is the sun, the sand and the sea that you are looking for, then idyllic Phuket must surely be on top of your list of destinations. Located in Southern Thailand, the island paradise of Phuket is just the place for you and your family to get away from the busy city life. 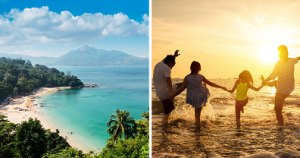 Chill out at beautiful beaches such as Patong, Karon, Kata Noi, and Mai Khao, and enjoy the stunning sunsets at Laem Phromthep Viewpoint. The young and young-at-heart can indulge in family-friendly water activities, knowing that when you are covered by Etiqa travel insurance, you have access to 24-hour free worldwide emergency travel support. Phuket is more than just beautiful beaches however. When you’re there, stretch your shopping dollar at the Phuket Week End Market in Phuket Town or check out the Chillva Market night bazaar for some late night shopping. You can also visit the many temples on the island, such as the popular Wat Chalong temple. For accommodation, choose from modestly priced hotels, or pamper your family to a stay in a luxurious spa resort. The choice is yours! Singaporeans love food, and at Phuket you can enjoy the best authentic Thai food. With options ranging from trendy restaurants in Phuket Town to beach-side eateries, you’ll be spoilt for choice. Okay, so you prefer the vibe and energy of city life to the tranquillity of beach-front resorts. A great choice in this case for your quick getaway will be Hong Kong (yes, another island recommendation!) Again, do remember to watch out for travel insurance deals at the Etiqa website before heading to the airport. Have no fear about travelling to Hong Kong during CNY – it’s not going to be a ghost town of closed shops! The Hong Kong Tourism Board assures that “…most shops and restaurants in the busiest districts will remain open. Some shopping malls may even extend their service hours. Major attractions, theme parks and public transport will operate as usual”. What’s more, you can catch exciting CNY festivities such as the International CNY Night Parade. Stay tuned to the Hong Kong Tourism Board’s website for updates on these festivities. Some say a vacation in Hong Kong is all about the food and the shopping. We agree! 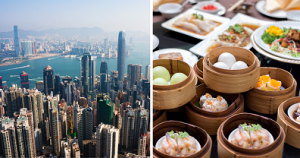 In Hong Kong you can enjoy the best of local pastries, Chinese cuisine as well as food from across the world. Award-winning Cantonese dim sum at Yum Cha restaurant at Central, Hong Kong Island, is a great option for lunch. For dinner, consider heading over to The Captain’s House at Tsim Sha Tsui for a taste of New Orleans seafood cuisine. In-between meals, go shopping at malls such as Cityplaza and Design Gallery, or go bargain hunting at popular outdoor markets like Ladies Market in Mong Kok and at the Apliu Street Flea Market. Love Jade? Then you’ll love the Jade Market in Kowloon where you can pick up rings, bangles, pendants and earrings. Should beaches and mega-cities not appeal to you, a third option to consider for the family getaway is Siem Reap in Cambodia. If that name doesn’t ring a bell, then surely the name Angkor Wat does! That’s right, the town of Siem Reap is just a hop away from the magnificent 900-year old Angkor Wat temple complex. So book your tickets and hotel early, check out our travel insurance promotions, and jet over to Cambodia for an unforgettable experience! Wake up earlier and head towards Angkor Wat with the family to catch the stunning sunrise from the temple complex. Seek out the “reflecting pond” to take a unique family photo with the reflection of Angkor Wat in the pond. With an area of over 162 hectares, Angkor Wat is a fascinating destination you can explore all day and soak in the history of the ancient structures. In Siem Reap, you can enjoy a show at the Phare Cambodian Circus where performers exhibit their acrobatics skills, or shop for authentic Khmer souvenirs and learn about traditional Cambodian handicrafts at the Artisans d’Angkor Art & Crafts Centre. Meal times will be a breeze as there is no shortage of good food at Siem Reap. For a taste of French-Asian fusion, head over to the Georges Rhumerie French Fusion Restaurant, or let local dishes delight your taste buds at the budget-friendly Try Me along Taphul Road. 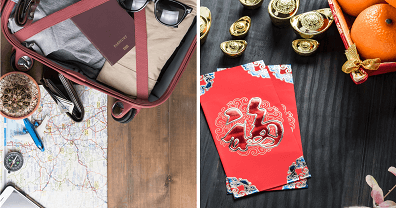 Whichever destination you pick for your family vacation this CNY, remember that travel insurance is an essential when you go abroad. There’s no need to search for travel insurance online anywhere else – Etiqa’s ePROTECT travel (available right here) has comprehensive coverage that caters to all types of travellers, including those travelling as a family. With features like real-time auto flight delay monitoring and claims, customers enjoy even greater convenience. Etiqa is a Singapore insurance company owned by Maybank Ageas Holdings. Maybank Ageas is a joint venture between Maybank Group – the fourth largest banking group in Southeast Asia with more than 22 million customers across 20 countries worldwide, and Ageas – one of Europe’s largest insurance companies with 33 million customers across 16 countries and a history of over 180 years. Protecting Singapore since 1961, Etiqa offers comprehensive insurance coverage and solutions with affordable and transparent insurance premiums. These include general insurance, life insurance, and travel insurance plans for personal and business needs. Etiqa is also one of the first insurance companies in Singapore to empower its customers with the option of online insurance. Etiqa is dynamic, progressive, and at the core of it all, committed to humanising insurance – placing people over policies.